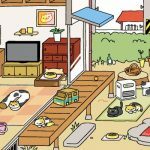 Neko Atsume: Kitty Collector is a game we’ve already covered in depth, but we do admit it’s quite a popular title, which is why we’ve got this definitive guide for you. But before we get to the guide, let’s give you a brief summary of what the game is about. This game has you collecting cats, simply by placing toys and snacks in your yard and waiting for the cats to come strolling in. There are over 40 cat varieties in here, and the game also notes that rare cats are “rumored to roam the neighborhood too.” In order to catch these uncommon felines, you’ll need specific toys or items to do so. 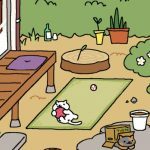 That’s the game in a nutshell, but if you really want to learn, or relearn the finer points, this Neko Atsume: Kitty Collector ultimate guide should be all that you need. First of all, let’s go back to the basics of the game. What you want to do is to place a toy in the backyard, with the option to replace that toy with another, depending on the breed that you want visiting your yard. The bowl of cat food also needs to be filled with “Bitz” – that’s the name of the food that ranges in price from the cheapest (Thrifty) to more expensive brands you can buy with gold coins. As a bonus piece of advice, you don’t need to have Neko Atsume open to verify if any cats have been attracted to your toy placement or food options. It’s fine to return to the game at any time, though we suggest checking regularly so you can make the necessary changes to attract more cats and log them in your diary afterwards. 2. What Toys Can Get You More Fish? You will receive fish when the cats aren’t playing with their favorite toys anymore. But what toys should the cats be playing with so you can get more fish? Several gamers claim that the yellowish ping pong ball, the big red rubber ball, and the small cardboard box are cheap toys that could draw in more fish. For example, one player was able to get 11 fish by placing the ping pong ball in the backyard, while another placed the small cardboard box and got 13 fish. 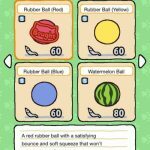 Other more expensive toys that could bring in more fish include the cardboard house (1 to 100 fish), the Zanzibar cushion (2 to 81 fish), the Temari Ball (a.k.a. hand ball, 2 to 26 fish), and the Thick Cooling Pad (2-20 fish). Gold and Silver Fish are the game’s currencies, with the former being the premium one and the latter being common. We’d say it’s a good thing that it appears to be very easy to get more currency for free. First thing to do would be to open Neko Atsume, then tap on the paw icon on the top left corner. Look for the News button, and when you see it, tap on it. You should the see a Daily Password on top of the pop-up window. Tap on Close, go to Menu > Other > Connect, tap on Input Password, and enter the Daily Password you had found a few steps earlier. After tapping on OK, you’ll get your free fish, though keep in mind that the password changes every day. You’ll need to repeat the same process the next day for more free Gold and Silver Fish, and while there are lots of steps involved, it’s all very nice and simple. Don’t skimp on those Frisky Bitz or Thrifty Bitz; as the names suggest, these are bottom-of-the-barrel brands of cat food that won’t have much of a chance of attracting rare cats. Heck, there are even some cats who will not bother to show up if you try luring them in with cheap cat food! What you would want to use are the foods that can only be purchased with Gold Fish, such as Bonito Bitz, Deluxe Tuna Bits, and sashimi. It is what it is – it’s a list of the different cats you can attract with toys. And here’s how everything plays out, as we list the cat’s name and the toy that can attract them to your yard. Take note that these aren’t all of the cats featured in the game, but all are among the most popular out there. 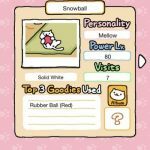 TUBBS – We’d say Tubbs is somewhere between being a rare cat and a common one, but as most consider him rare, we’ll give him a detailed write-up. Unlike some other rares, Tubbs isn’t THAT picky with food; anything better than Thrifty Bitz is fair game for him. Let him sit for some time after he’s done eating, and he’ll give you a ton of fish in return. You can also place the Giant Cushion outside and there’s a fair chance Tubbs will arrive at your yard. MR. MEOWGI – Scratching Log or Sakura Pillow. LADY MEOW MEOW – This is another rare that shows up if you bring something special, and that something special is the Luxurious Hammock. If you put cheap food out there, forget it – she’s not coming over. GUY FURRY – Cheap food doesn’t seem to be up Guy Furry’s alley at all, but this feline cook can be lured to cook for you if you use a Glass Vase or Heating Stove to attract him. KATHMANDU – More rare cats, and yet another finicky type who will not show up if there’s cheap food to be had at your yard. His favorite toy is the Temari Ball. Want more tips and tricks for the game? Check out our first guide for Neko Atsume: Kitty Collector, which contains additional hints for this addictive title. I’ve been playing this game for a few months and I just love it. I have all the rare cats and are now just trying to collect all their mementos. Hang in there and you’ll get them all.